Pilley & Reid (2010) describe an experiment where a border collie was trained to learn proper nouns for objects. After 3 years of training, the dog had learned over 1,000 proper names and showed no sign of slowing. Experiments were run to test whether the dog understood the difference between nouns and commands and whether the dog could learn words that represented categories of things. Hot on the tail of Rico, another wonderdog, this provides striking evidence for word learning in non-primate species. This dog has more toys than I did, including a weird levitating moose. I liked some of the descriptions in the methodology section: “Upon successful retrieval of the item, Chaser was told ‘Good dog’.”. There’s not nearly enough of this kind of encouragement in human experiments. I also liked the fact that the authors posted videos with the article so you can see the experiments in action. Early in Chaser’s training, we corrected her immediately if she retrieved an incorrect object. As the result of this training, if she did not remember the name of an object, she would simply stand among all the objects without selecting one. Thus, on the first exclusion learning trial when she did not return with an object, a quick look revealed that she was simply standing among the objects. Only with repeated encouragements to fetch the newly named novel object, did she finally retrieve the novel object. Special encouragement was also necessary on the second replication. On the remaining six replications, she continued to retrieve novel objects successfully without further encouragement or error. Thus, Chaser was successful in eight successive replications, conducted over 8 days, in retrieving the novel objects. Not the most clear-cut result, but the dog clearly got the idea that he was being asked for an object he had no label for. However, it’s less clear whether the dog learned a new label in this way. When asked to retrieve the new object with the new label immediately after the trial, the dog was successful. However, success declined over time to well below chance after 24 hours. Pilley & Reid suggest that positive feedback (e.g. a period of play with the toy whilst using the new label) is needed to form new word-object mappings. Children exhibit mutual exclusivity, and can use it to learn new words. However, this may be a learned process rather than an innate bias, because bilingual children do not reliably exhibit mutual exclusivity. Chaser appeared to have a weak Mutual Exclusivity bias – he needed encouragement to fetch the novel object. Learning did not occur as a process of the deduction, either. It would be interesting to see this experiment done with a bilingual dog. 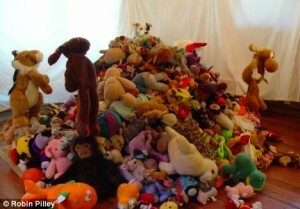 Maybe Chaser was bilingual already, with his own doggy-words for his gigantic mountain of toys. Exclusion learning, also known as fast-mapping, is a widely studied phenomena in behavior analysis and psycholinguistics (http://bit.ly/hJMBOX). This study extends the still-to-be-replicated study with Rico to a greater number of conditional discriminations and shows a facilitative effect of multiple-exemplar training, as predicted by relational frame theory. Performance of Chaser is not symbolic or novel, however, but based on direct training (i.e., not bidirectional). Neat study though! Wow, that’s cool. Dogs seem to be good at language. Every dog owner knows that they can quite easily learn the word “walk” and get very excited at the prospect – our old dog learned it so we had to start saying “W.A.L.K” but then he learned that, too. By contrast, I have never seen any evidence that cats learn words. They recognise sounds like opening a tin of catfood very well, but I’ve had 3 cats in my time and I’ve never been convinced that they can distinguish words, even their own names, or “food”. This may be to do with the different aims of domestication. Dogs were bred for understanding human social cues for hunting. They can understand pointing, for instance. Cats, on the other hand, were bred to ignore and disdain us. Darcy Morey (2010) ‘Dogs: domestication and the development of a social bond’. Hare et al. (2010) ‘The domestication hypothesis for dogs’ skills with human communication: a response to Udell et al. (2008) and Wynne et al. (2008)’ Animal Behaviour 79. I am pleased by your thoughtful comments about our paper. As John and I wrote successive drafts of our paper, we decided against making statements about mutual exclusivity bias. On one hand, it does seem to be a potential explanation for how Chaser was (and still is) able to be so accurate in selecting the correct previously-unnamed object from a group of familiar named objects in Expt. 4 -“Learning words by exclusion.” On the other hand, Expt. 3 -“Learning common nouns” clearly showed that Chaser had learned several names for each object. Each toy had its unique proper-noun name, but it could also be classified by the common noun “ball” and “toy”. Thus many objects could be identified by three names. This one-to- many and many-to-one word/object mappings seemed to us to reject the assumption of mutual exclusivity. We are aware of other competing explanations for correctly selecting the novel object in these experiments, but we did not believe our data clearly favored any particular explanation. So, while we were not ready to attribute her success to mutual exclusivity bias, we did not want to promote an alternative explanation for this inferential reasoning.